I must be getting old because I've already started saying things like, "No presents or I'll kill you," or "Don't take me anywhere fancy because I don't want to waste money." Despite my bitter old Chinese housewife inclinations, Wes still made sure that this birthday was a memorable one. He came back early from work on a Tuesday and cooked things that, if seen printed on a menu at some restaurant, I'd order right away. 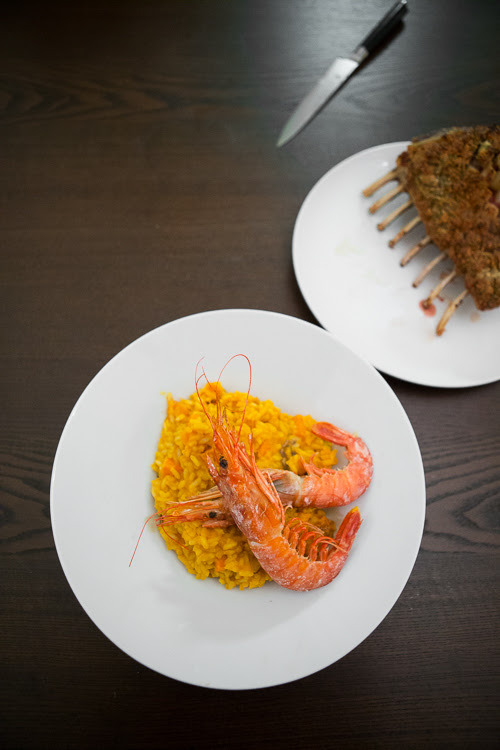 These things were: (cheeseless) butternut squash risotto with broiled prawns, rack of lamb, haricots verts with tomato and mushroom, and (gasp) matcha doughnuts - that is, both glazed with matcha AND filled with matcha. Taking the time to read through, write down, and ask Wes about his experience with these recipes has made me truly appreciate all the hard work that he put into these dishes. 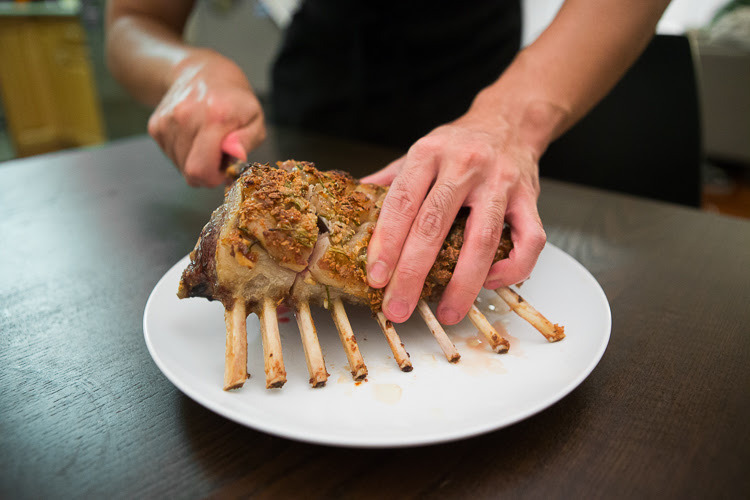 I don't think that I would have had the patience or the time-management skills myself to pull this off, but maybe if I write down these recipes for the future, I'll be able to set aside a whole day to recreate everything! 1. Preheat oven to 400°F. Cut about half the squash into 1-inch chunks to yield 4 cups. Cut remaining squash into 1/4-inch dice. In a large mixing bowl, toss large squash chunks with 2 tablespoons olive oil, garlic, apple, red pepper flakes, and a large pinch of salt until evenly coated, then spread in an even layer on a rimmed baking sheet. 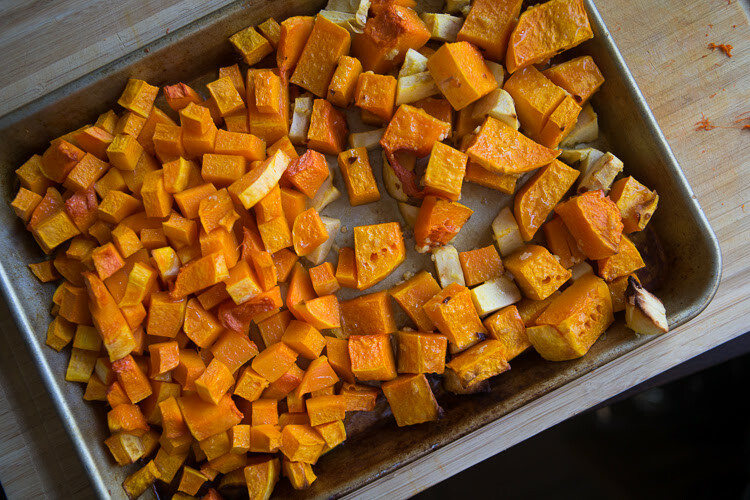 In a separate bowl, toss small diced squash with 2 tablespoons olive oil, maple syrup, and a pinch of salt, then spread in an even layer on a second rimmed baking sheet. 2. Bake both trays of squash, stirring once or twice during baking, until large chunks are very tender, about 45 minutes, and small diced squash is browned in spots, about 30 minutes. 3. 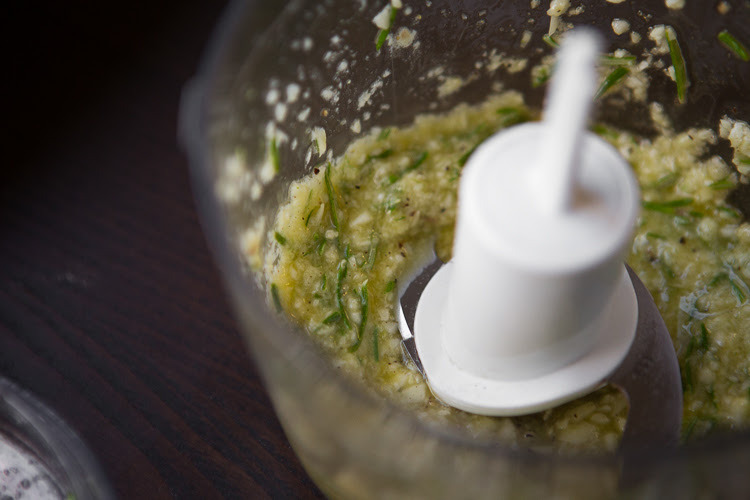 Transfer large squash chunks, apple, and garlic cloves to a food processor, blender, or the container of a stick blender. 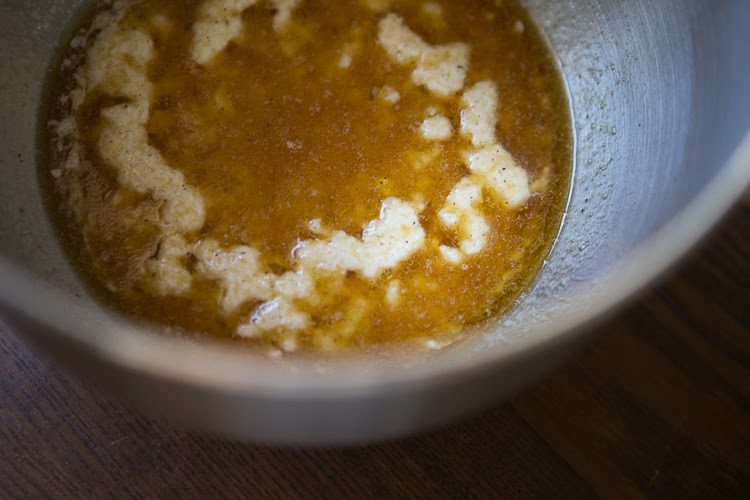 Add 1/4 cup broth and blend until a smooth puree forms. Season with salt. 4. 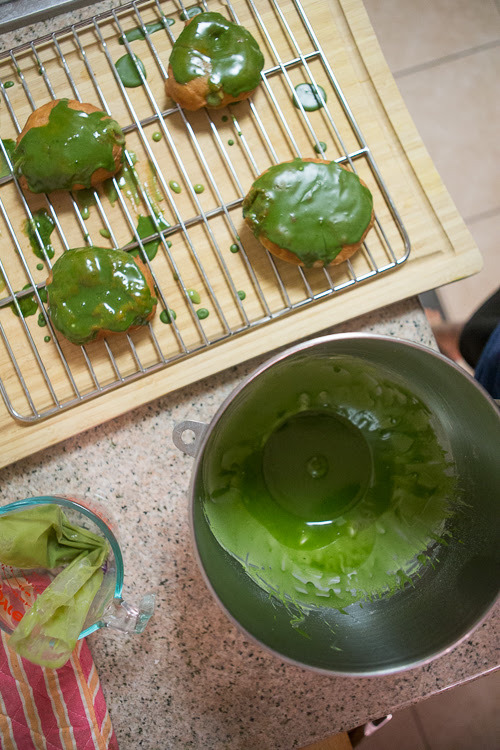 Heat remaining 2 tablespoons olive oil in a pressure cooker over medium-high heat until shimmering. Add onion and cook, stirring, until translucent but not browned, about 4 minutes. 5. Add rice and cook, stirring, until rice is evenly coated in oil and toasted but not browned, 3-4 minutes (rice grains should start to look like tiny ice cubes: translucent around the edges and cloudy in the center). 6. Add wine and cook, stirring, until raw alcohol smell has cooked off and wine is almost fully evaporated, about 2 minutes. 7. Stir in remaining 3 1/2 cups broth, scrape any grains of rice or pieces of onion from side of pressure cooker so that they are fully submerged. Close Instant Pot, set to cook at low pressure for 5 minutes. Make sure that the vent is in the closed position. 8. Depressurize cooker by releasing the valve. 9. Open pressure cooker and stir to combine rice and cooking liquid; it should begin to form a creamy consistency. Stir in squash puree. 10. If risotto is too soupy, cook for a few minutes longer on Sautee setting, stirring, until it begins to thicken more; it should look like a smooth creamy sauce. 11. If you want the cheese in it, now is the time to stir in a generous grating of Parmesan cheese, followed by the maple-roasted diced squash. Season with salt. 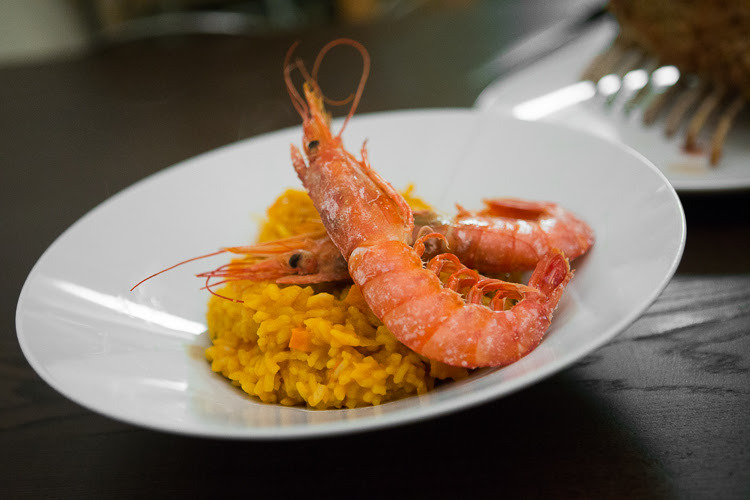 Top with more grated cheese and prawns. For the prawns, simply wash and salt-crust the buggers on both sides and place under the broiler on 400, for just a few minutes on each side. 1. 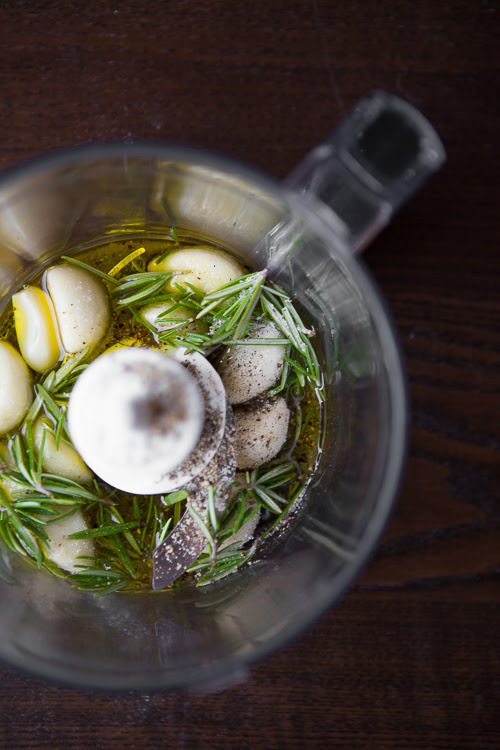 Season with garlic, rosemary, salt, pepper, olive oil. 2. 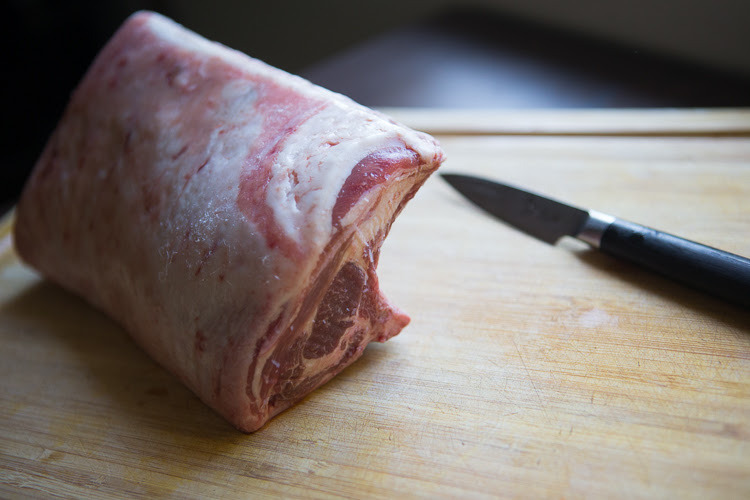 Score the fat cap with a sharp knife and rub in the seasoning. 3. 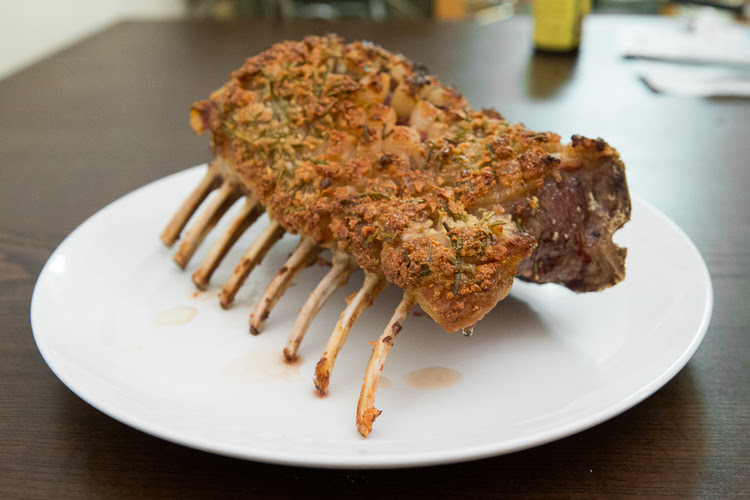 Place in the oven at 450 for 15 minutes on the middle rack. This is to break down the fat and crisp it up. 4. 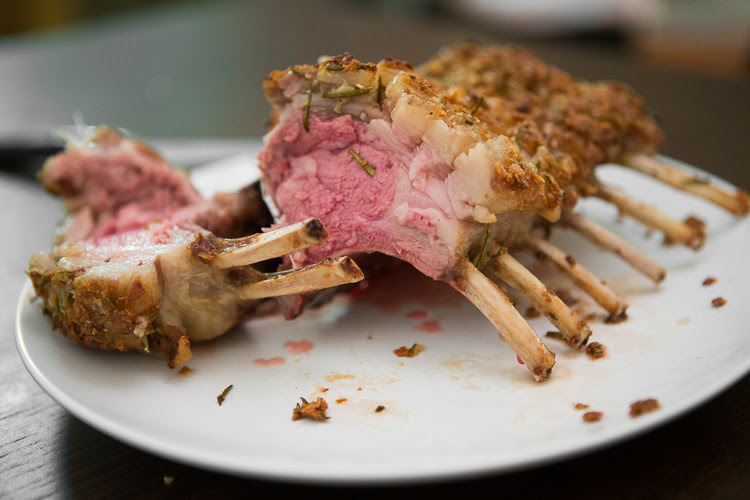 Reduce the temperature to 350 and cook on the lower rack, until the internal temp of the meat is 130. He has a temperature probe, so he checked the temperature every few minutes after 15 minutes. 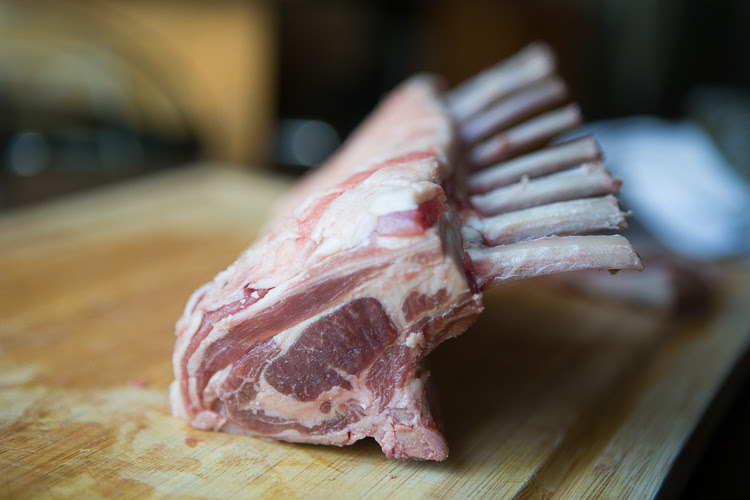 Just a note, Wes likes the temperature probe because it allows him to check on how the meat is doing without opening the oven and disturbing the cooking process. It's nifty. 1. 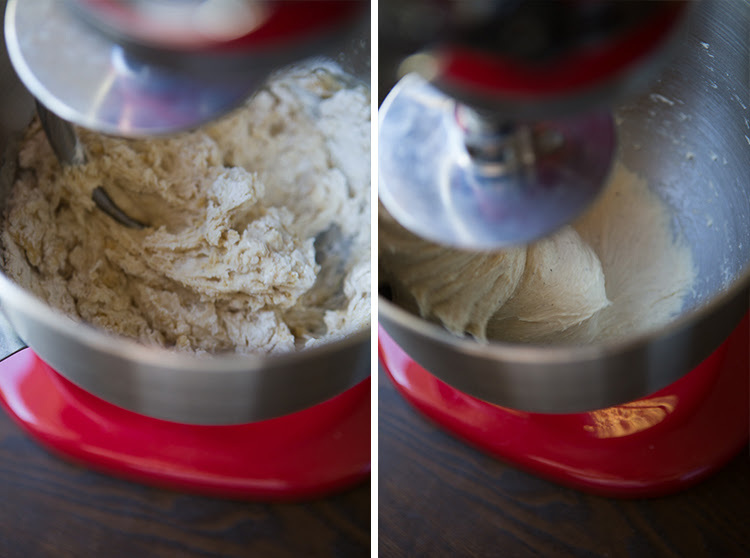 In a stand mixer, add all the dough ingredients except the bread flour. Give it a stir and let it sit for 10 minutes, until it gets frothy. 2. 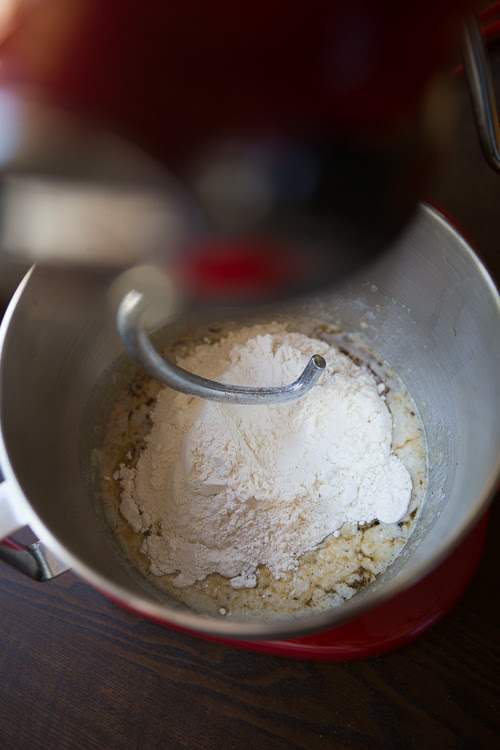 Add the bread flour and using the dough hook attachment, mix on low-medium speed for 5-7 minutes. 3. 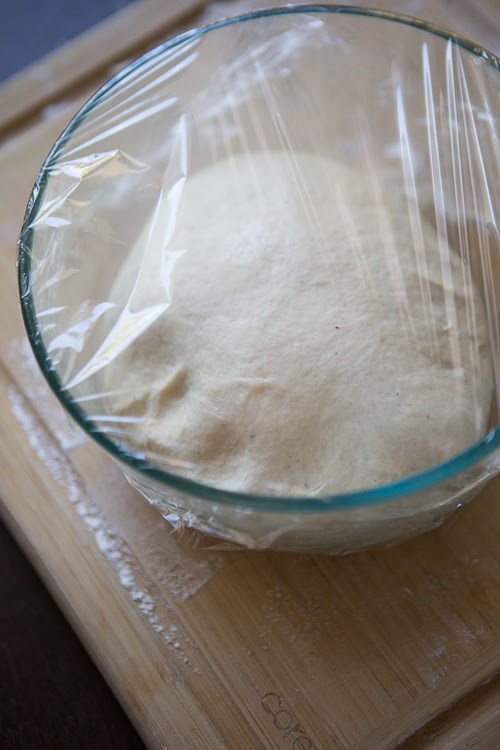 Transfer the dough onto floured surface and knead dough for about a minute. 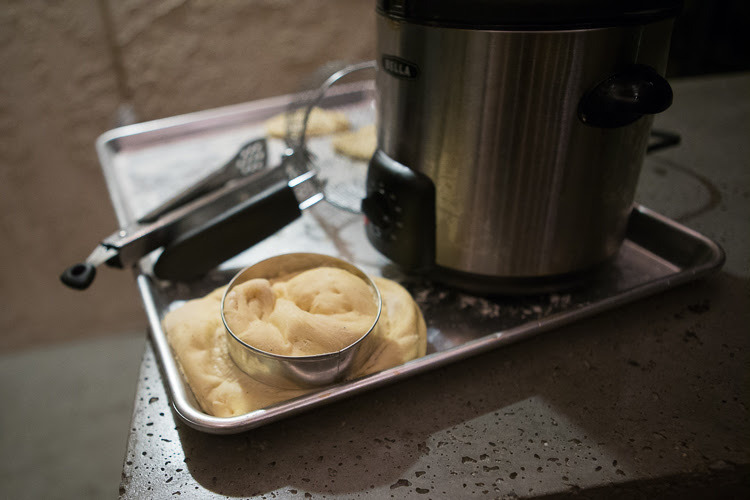 Coat a bowl with canola oil / butter and add the dough into it. 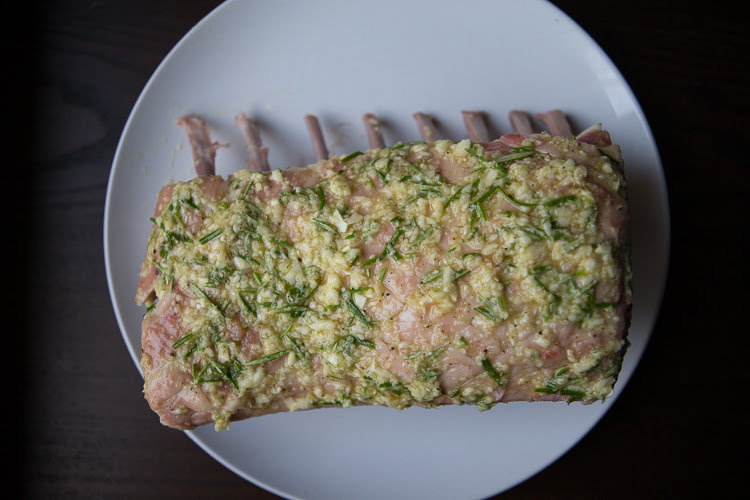 Cover and set aside for about an hour for proofing. 4. 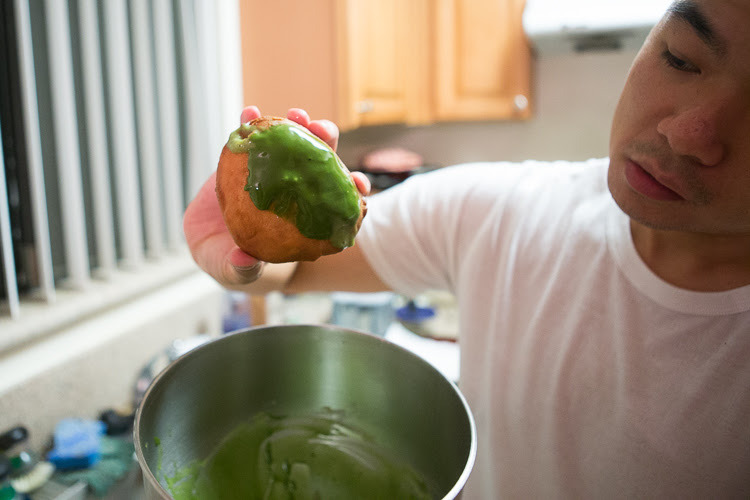 Custard filling: In a small sauce pot, add almond milk, matcha powder, sugar, and vanilla extract. On low to medium heat, whisk the mixture. Add corn starch and keep whisking until there are no lumps, and starts to thicken. Crack an egg into a small mixing bowl, ladle a small bit of the mixture in and whisk it together. Slowly transfer the egg mixture back into the sauce pot and whisk vigorously. Bring heat up to a simmer for about 2 minutes and keep whisking. Transfer to a bowl and put in the fridge to cool and thicken. 5. 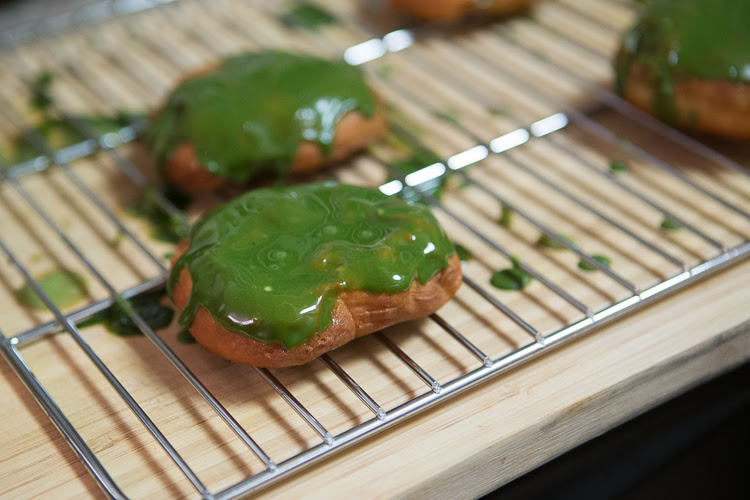 Glaze: Add vanilla extract, matcha powder, powdered sugar, and almond milk into small bowl. Whisk. Adjust as needed with powdered sugar. 6. 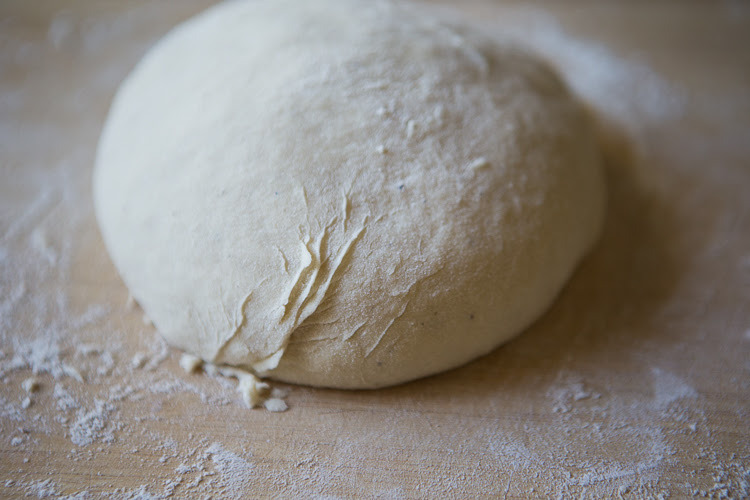 Back to the dough: Flour the working surface and knead the dough into a small smooth ball. 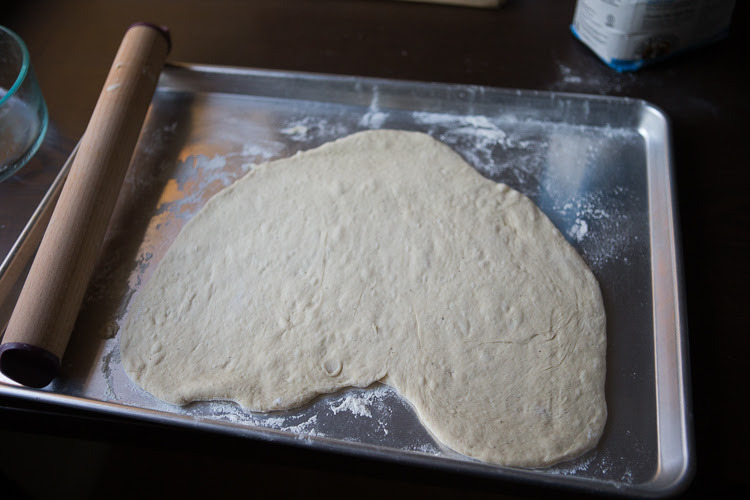 Flatten and roll out to a quarter inch thickness, cover with a wet towel and let it rise for about 20 minutes. Punch out doughnut rounds with a ring mold. 7. 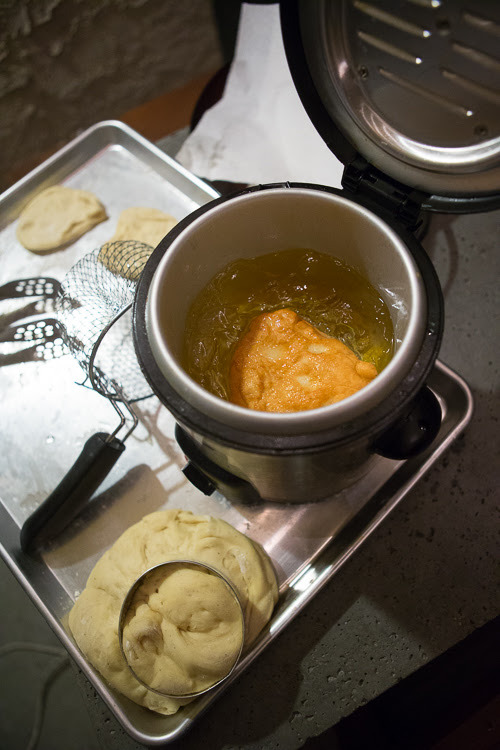 Fry the dough in 350-degree canola oil for about 2-3 minutes on each side. 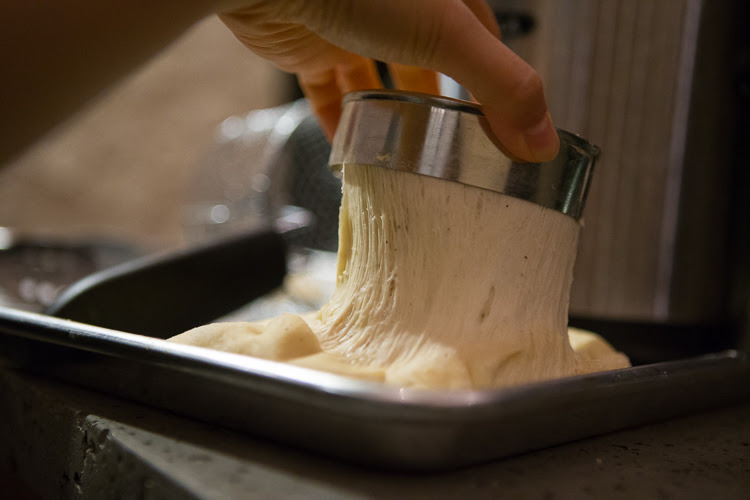 Not too long, or else the dough gets too crispy and tends not to hold the custard filling as well. Transfer to a paper towel. 8. 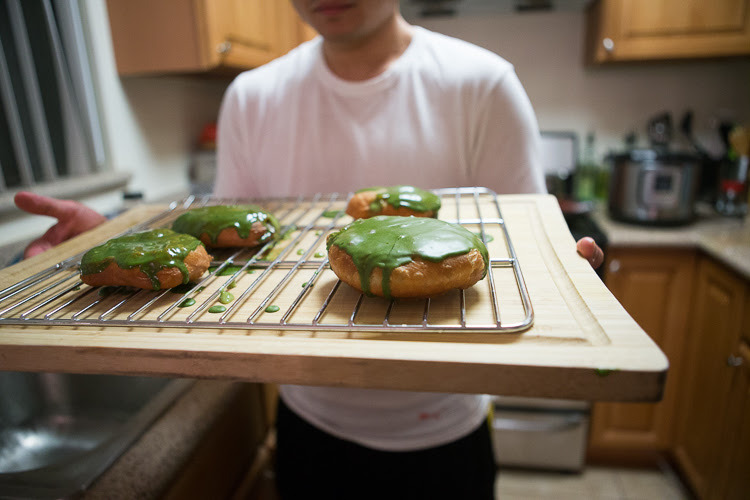 Pipe the doughnuts with matcha custard. 9. 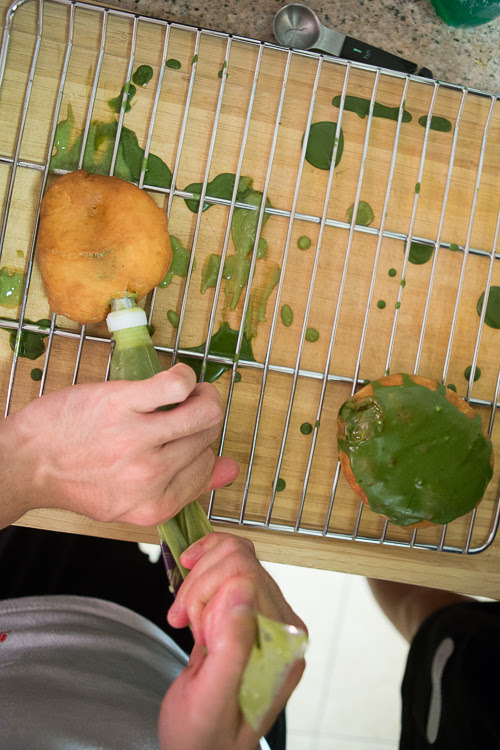 Dip the tops of the doughnuts in the matcha glaze and set to cool on a rack. It was so fun to make them! Actually, after we ate dinner, Wes told me to go and hide in the office while he prepared dessert, so I didn't get to participate in the process. But then, after we ate the doughnuts together, he showed me that there was still some dough left, so we made some more together and I got to document the process on camera. 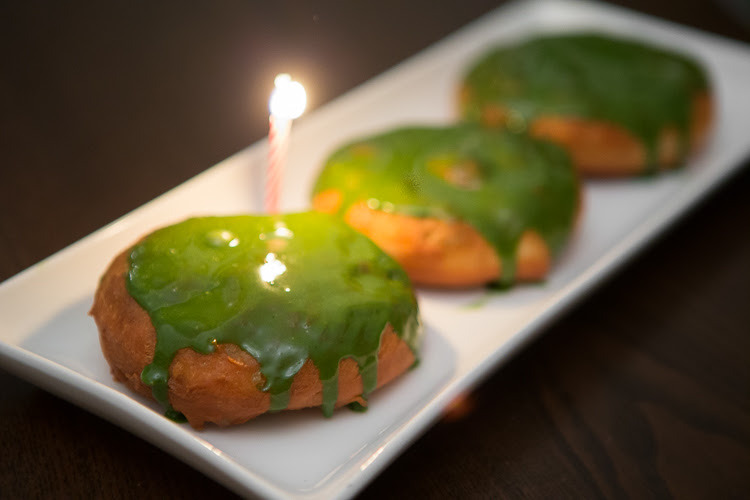 These doughnuts really deserve their own blog post, and were definitely the most complicated things that Wes set himself up to prepare that night. They were insanely delicious. 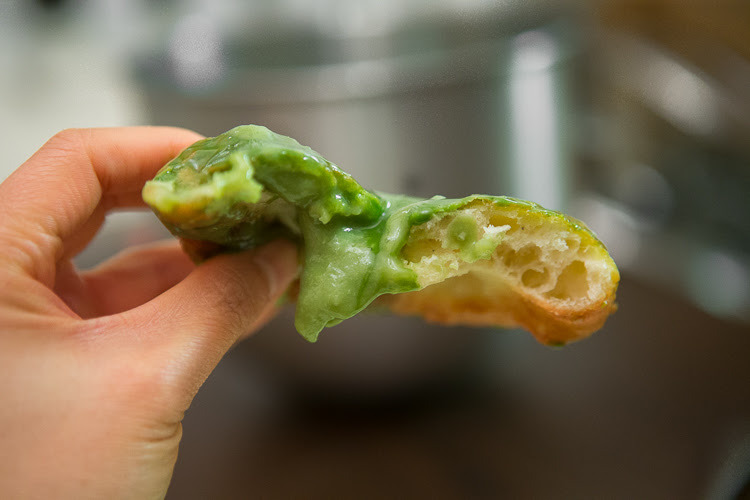 So, that's the almond milk-based matcha custard oozing out of a freshly fried doughnut (which tasted almost like those wonderful Chinese doughnuts that they put in porridge). And the glaze... I just dunked pieces of dough right into the bowl in the end. This was matcha heaven. 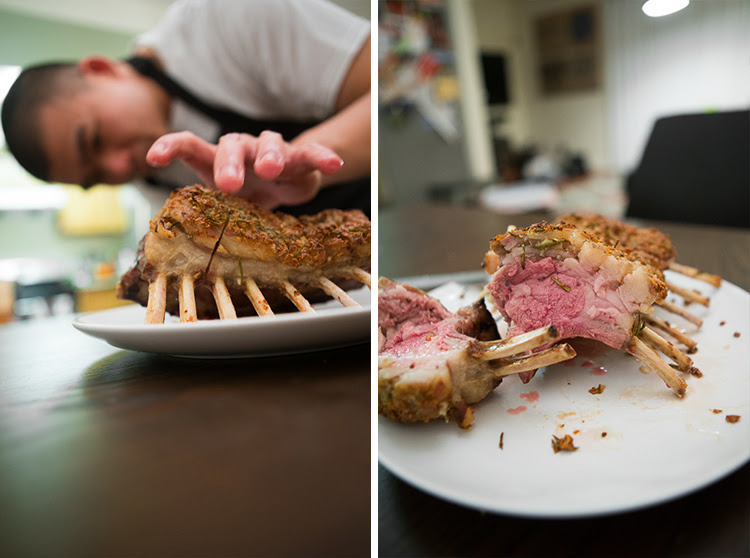 Thanks for pulling off another great cooking venture for me, Wes!